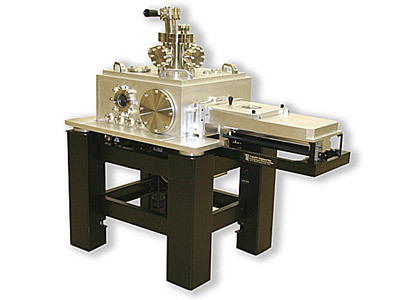 Reticle Introduction and Positioning System: This HV compatible vacuum system with XY stage in the aluminum process chamber was provided to College of Nanoscale Science and Engineering at the University of Albany. It is designed to allow the user to position a 6" X 6" reticle in front of an EUV source for advanced EUV Lithography development work with Sematech in Albany, NY. This system uses a TEAM-Mate-200-LR configured with a paddle to handle the reticle. The entire system including the loadlock is floating on an air table to minimize vibration.